same time... ya ta hey is a voice for this spark". On November 20th, 1969, seventy-nine American Indians, lead by activist Richard Oakes, sailed to Alcatraz Island and occupied the dilapidated former federal prison complex. Citing the 1868 Treaty of Fort Laramie, which stipulated that any dis-used Federal lands should revert back to Native American control, occupiers claimed the island for the “Indians Of All Tribes”. At its height, the occupation of Alcatraz included over 700 individuals, including dozens of women and children. On June 11th, 1971, nineteen months after the first occupiers arrived, Federal Marshals and FBI agents peacefully removed the last activists from the island. In November of 1969 Blaine Ellis was living in a houseboat community on Richardson Bay, not far from the escalating events on Alcatraz. Ellis witnessed successful efforts by his neighbors to bring medical supplies, food, water and Indian activists to the occupied island, despite a US Coast Guard blockade. Recognizing the historical and political significance of the occupation, Ellis approached Walter Chappell about making a documentary film. That November the filmmakers received permission from occupation representatives to begin filming, and made their first of many trips to the island. The resulting film, ‘Ya Ta Hey Alcatraz!’, is an impressionistic documentary chronicling life and work on the occupied island. Unique among contemporary records of American Indian activism from the time, ‘Ya Ta Hey! 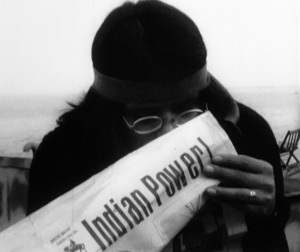 Alcatraz’ depicts in sympathetic detail the efforts of Native American activists to bring attention and intention to the struggles and aspirations of their people.